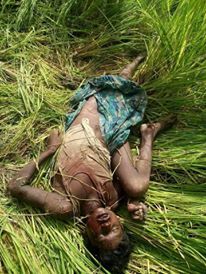 Mrauk-U, Arakan – Two Rohingyas from Mrauk-U and Minbya Township in Arakan State were attacked by Rakhine extremists and one was killed while another one escaped and now is in police custody. There were two Rohingya young men who work at farms as daily wages workers, one named Sadek S/o Shofi Alam (Aged 20) from Si Thay village Mrauk-U Township who worke at the farm of Hason in the same village, while another young man is named Shomshu Alam S/o Dil Mohammed (Aged 18) from Nagara village, Minbya Township, working at the farm of Mohammed Shah in Si Thay village, Mrauk-U Township. On November 2nd at 5pm both of them went to paddy field to cut some grass to feed their cattle. 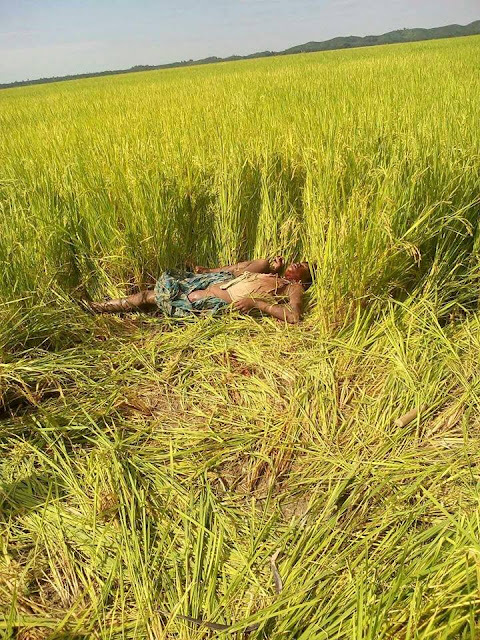 While they were cutting and collecting the grass, a group of Rakhinese Dai-net (Samma Buddhists) extremists from Nan Kya Rakhine village nearby the paddy field came and surrounded them and started attacking both with swords and knives. Despite this Shomshu Alam was able to flee with injuries, Sadek, however, was unable to escape and was brutally killed by the extremists group. While Shomshu Alam was trying to escape from the extremists, he reached to Nan Kya Rakhine village and he was beaten again by the Rakhine villagers at there. The police have received information informing them that Shomshul Alam was attacked. The police came to the village at 11pm on that day and brought him to police custody at Min Bwe station, Mrauk-U Township. Shomshul Alam has been in police custody in Min Bwe police station and no one is allowed to meet or talk with him. The dead body of Sadek was found at 8am on November 3rd. Now the police have charged that Sadek was killed by a Rohingya man from Pe Pin Yin village in Mrauk-U Township even with Shomshul Alam as an eye-witness dismissing this accusation. The police mean to arrest the man who stands accused instead of arresting the Rakhine extremists group.